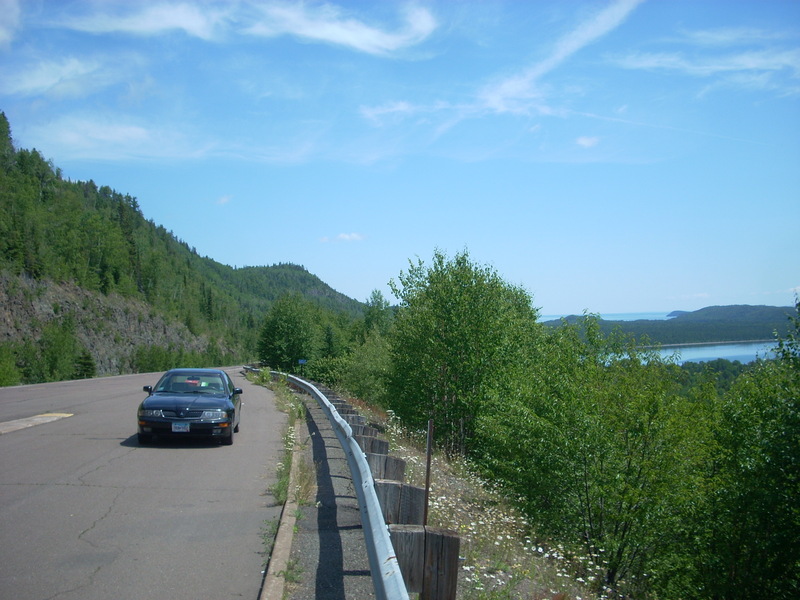 Like most states in the US, Minnesota has a long history of Native Americans here long before European settlers found their way over. But in the roadside attractions world, it’s only right that we give a tip of the cap to the history of Indians that have long since been in our state, and we’ve selected 10 of the best statues that commemorate them. 10. 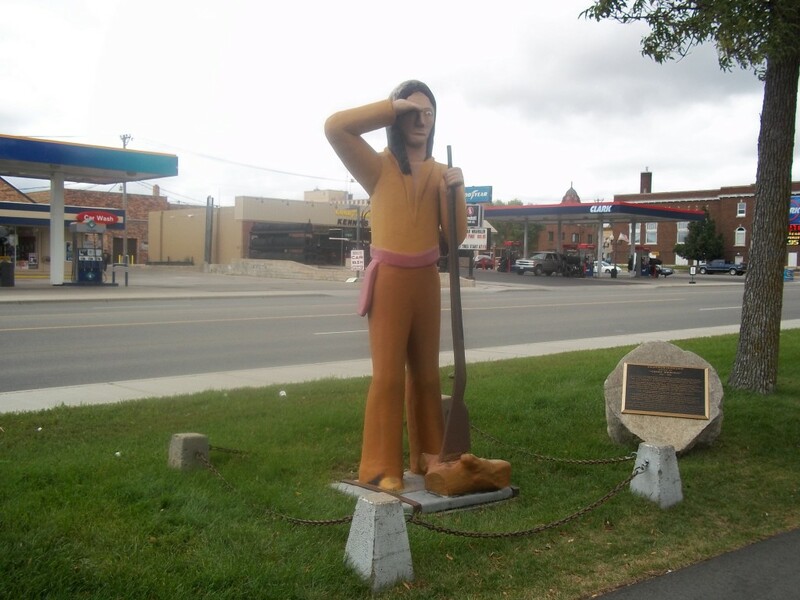 Chief Wrinkle Meat, Jacobson – We’ll start off the tour with the curiously named “Chief Wrinkle Meat” statue in tiny Jacobson, MN. 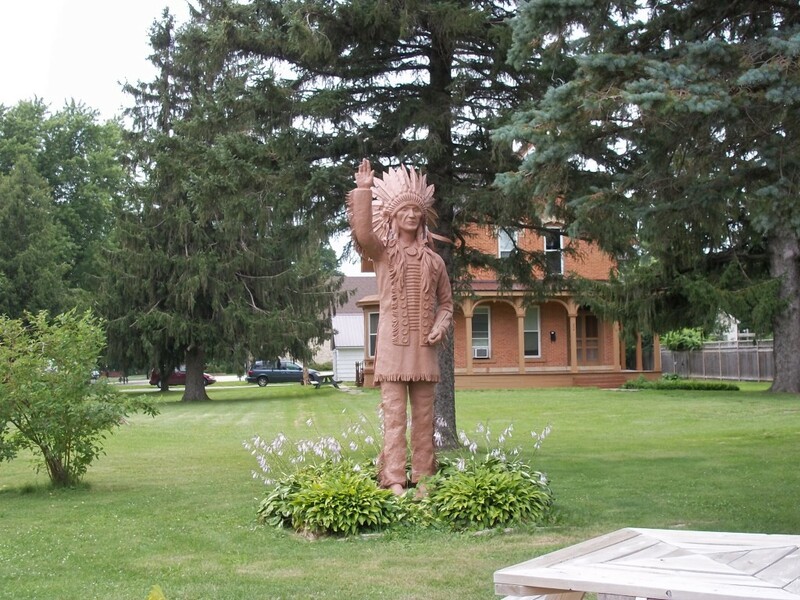 This life-size wood-carved statue honors Chief Wrinkle Meat, a local Chippewa who died in 1922 at the age of 137. Chief Wrinkle Meat stands in a small pavilion in a little roadside park with dozens of other quirky little statues, signs, and sculptures. 9. 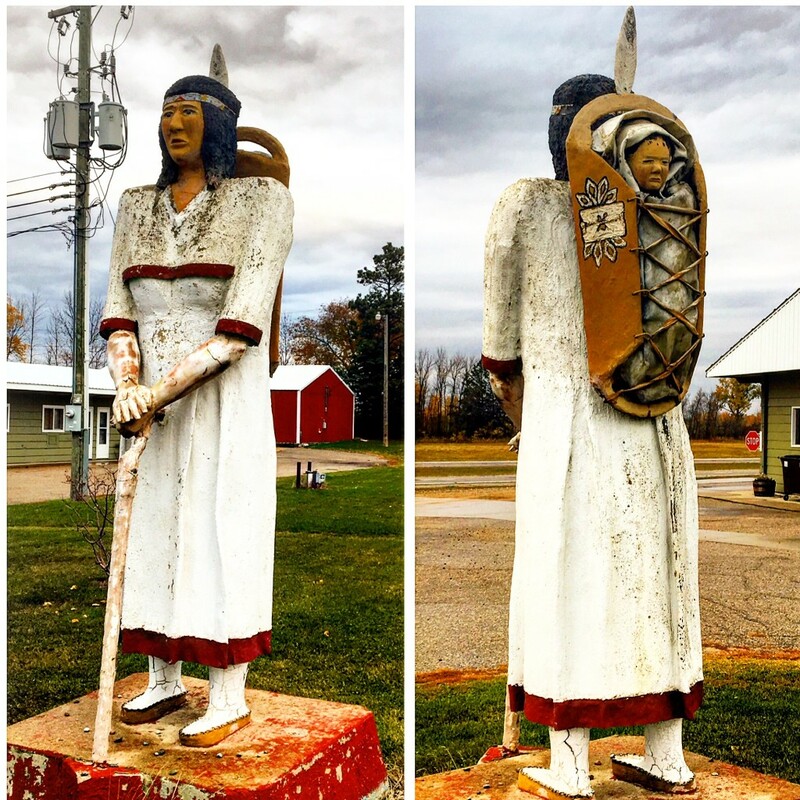 Indian Woman and Papoose, Erskine – One of Ernie Konikson’s six concrete sculptures in northern MN, the Indian Woman (with a papoose on a cradleboard on her back) was built back in the late 1960’s. Several other of his statues can be seen in Erskine and surrounding towns. 8. Chief Bemidji (Shaynowishkung), Bemidji – The Chief Bemidji statue in Bemidji stood alongside the lake near the Paul Bunyan and Babe statues, it was moved for some reason in 2014 (where it had stood since the 1950’s), to the Beltrami County Historical Society where they now charge a $5.00 fee to tour the museum. 7. 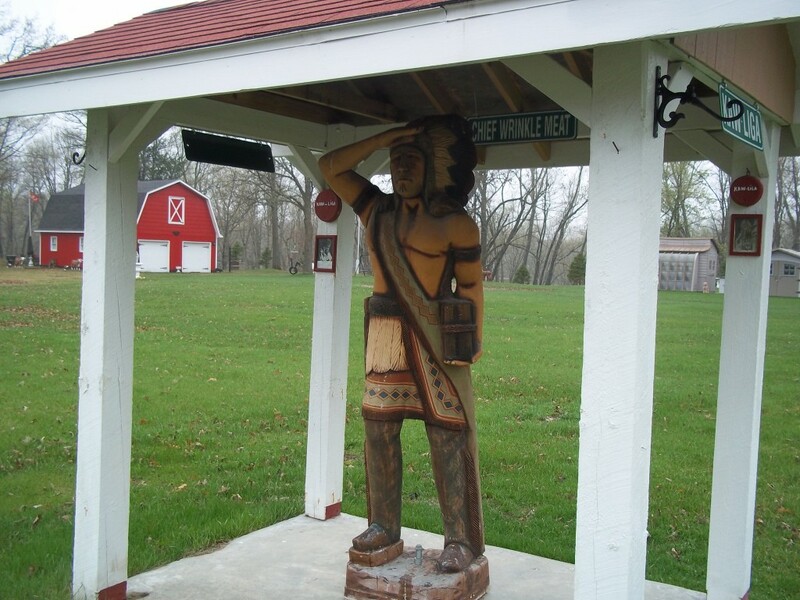 Cigar-Store Indian, Spring Valley, MN – Down in Spring Valley, MN, there stands a cigar-store Indian statue outside of the visitor’s center. This Indian statue used to stand at the entrance of the nearby Mystery Caves, but has been since relocated here. 6. 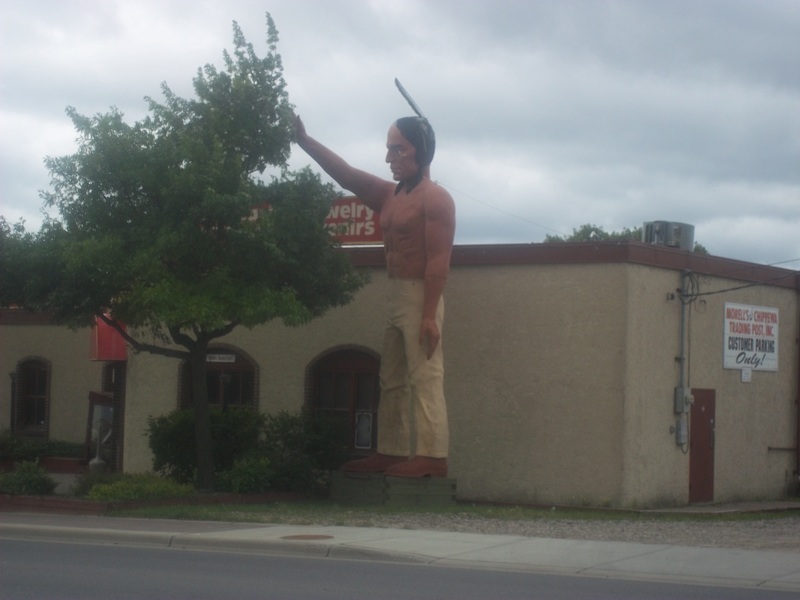 Cheif Nanobouzou, Bemidji – A Muffler Man-style Indian statue, Chief Nanobouzou in Bemidji stands across the street from the iconic Paul Bunyan and Babe statues. As legend has it, Chief Nanobouzo took down Paul Bunyan (for cutting down all of Minnesota’s trees) once and for all by beating him with a fish. 5. 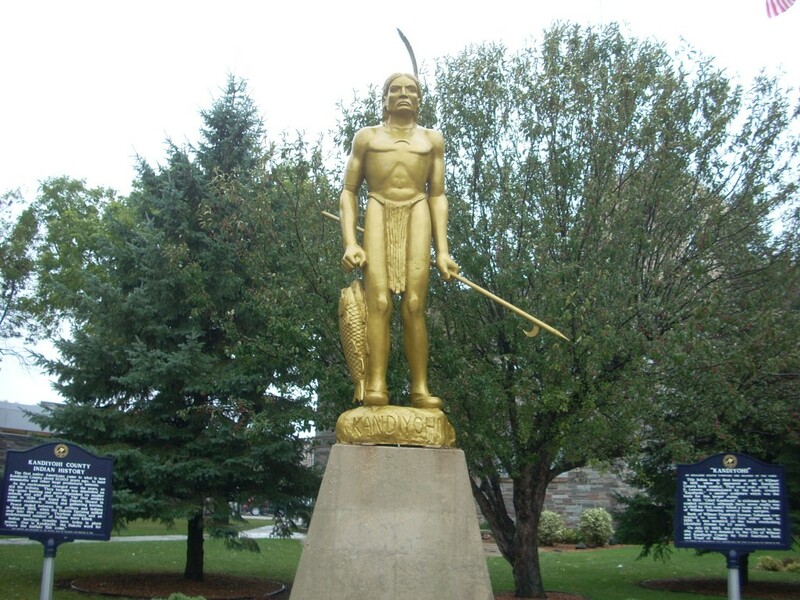 Chief Kandiyohi, Willmar – The statue of a fictitious Indian named “Kandiyohi,” situated in downtown Willmar, used to be mounted on top of a bank. The statue dates back to 1956, when the bank used the Indian chief as their symbol. It was later moved downtown in a small park where it stands today. 4. 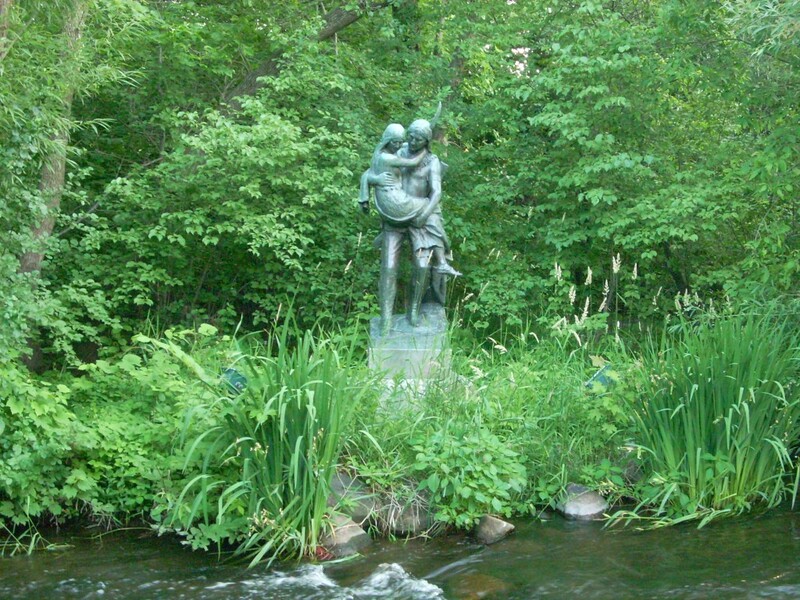 Hiawatha and Minnehaha, Minneapolis – The bronze statue of the fictitious Minnehaha carrying Hiawatha stands at Minnehaha Falls in Minneapolis. These two never actually existed, and the author who wrote about them, Henry Wadsworth Longfellow, in his poem The Song of Hiawatha, had never even actually visited the Falls. 3. 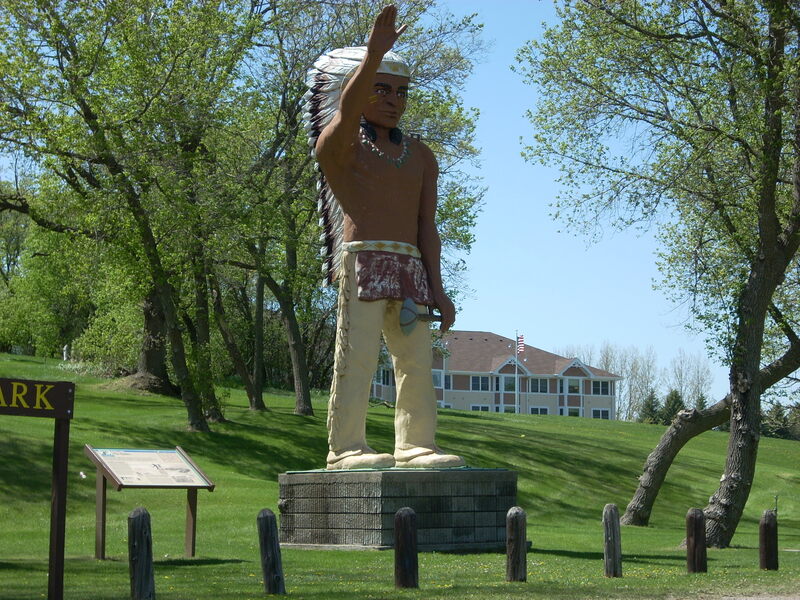 Chief Wenonga, Battle Lake – In Battle Lake, MN, there is another Muffler Man overlooking the eponymous lake, which denotes a battle between Dakota Sioux and Ojibwe which took place around 1795. Chief Wenonga, as he is know, is situated in a small roadside park overlooking the lake. 2. 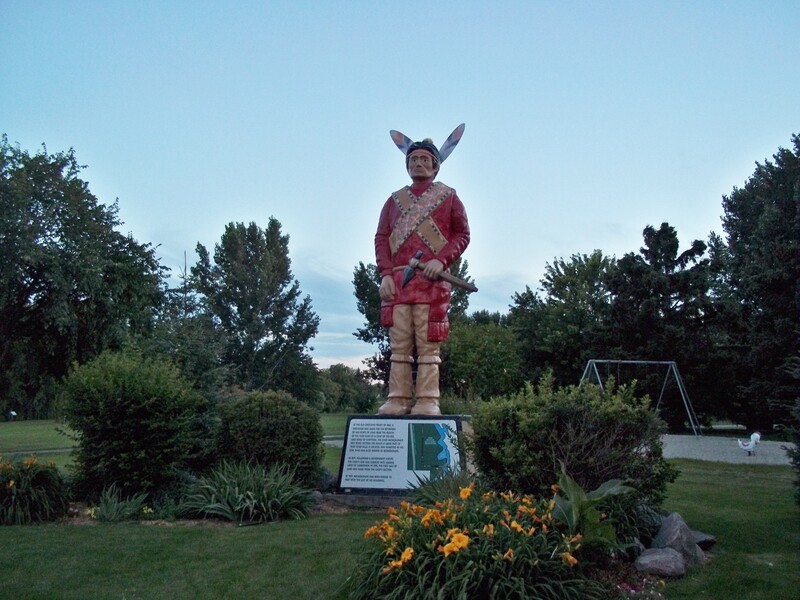 Chief Red Robe, Thief River Falls – Also known as “Chief Moose Dung,” the statue of Chief Red Robe in Thief River Falls stands in a city park by the Thief River. It commemorates an Indian chief who made a treaty with the white man for land in northwest Minnesota, where he has stood since 1976. 1. 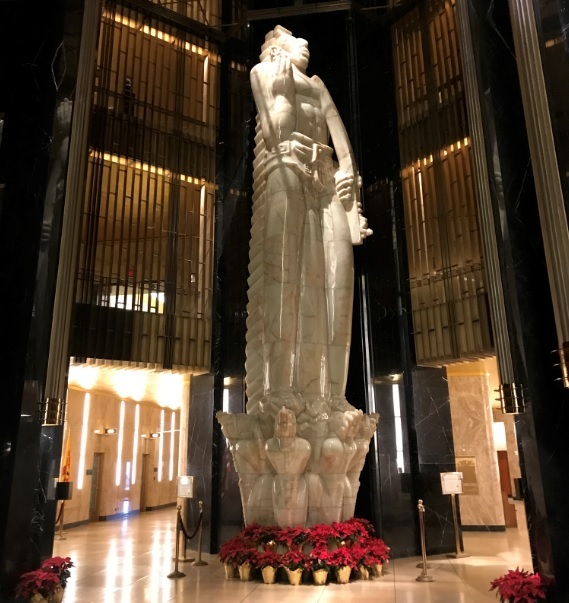 Indian God of Peace, St. Paul – Standing three stories tall inside the concourse of the Ramsey County Courthouse and St. Paul City Hall building (an Art Deco beauty by itself), is the little-known yet awe-inspiring statue, “Vision of Peace.” Made of white Mexican onyx and sculpted in the 1930’s by Swedish artist Carl Milles, it was designed in Art Deco fashion and originally named Indian God of Peace, and later renamed Vision of Peace. It’s one of Minnesota’s most incredible works of art, and almost completely unknown to most residents. #7 Cigar-Store Indian is located in Spring Valley, MN, not Spring Grove, MN.